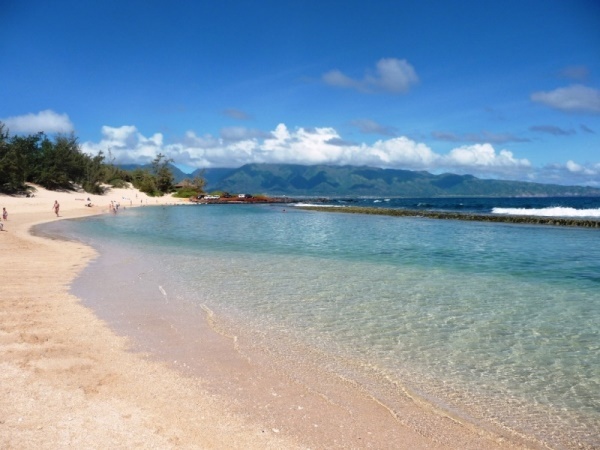 Baby Beach is part of Baldwin Beach and accessed from Sprecklesville, just outside of Paia town on Maui's northshore. In the mornings, before the tradewinds pick up, this beach and its protected swimming area is like a beautiful aqua blue swimming pool and a big sand box all in one place. Baby Beach is at the very end (west end) of mile-long Baldwin Beach and is considered by many locals and visitors alike to be the best part of Baldwin Beach. Adults and kids of all ages love what this beach has to offer. 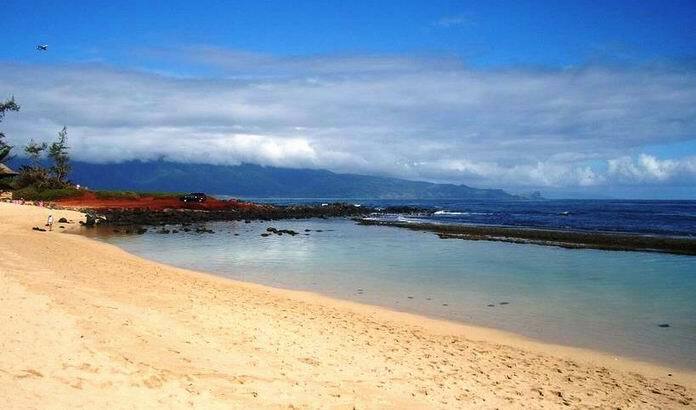 Swimming or jogging for fun or exercise, snorkeling, playing with beach toys and inflatable toys, building sand castles, or just relaxing and soaking up the sun with the cool Maui breeze on your skin. An ideal beach for taking young children for a fun and safe swimming environment. The best time to be at this beach early to mid-morning, before the tradewinds strengthen. Usually the tradewinds will fill in by noon, though if it's a light-wind day, then anytime of the day is a good time. Apply sunscreen generously before you leave the house since you'll probably want to stay at the beach longer than you expect and this gives the sunscreen time to absorb and less likely to be washed off so quickly. Pack drinks and snacks for everyone. Bring beach chairs for adults, and beach toys for the kids. Little kids also love to just float around with boggie boards, so bring those too. A beach umbrella is great, though only good if it's not too breezy. Bring a large bottle of "shower-water" to rinse of your feet and/or body when you get back to your car. There are no showers here and the parking area is in a red-dirt public parking lot. So, best to wash that red-dirt off before continuing to the rest of your day (it can stain your clothes). There are no public restrooms at this beach, though there are restrooms and showers at the other end of Baldwin Beach, fyi. Do you want to stay in a vacation rental that is walking distance to Baby Beach? Wide-angle view of Baldwin Beach to the left (east) and Baby Beach to the right (west), facing the beach. Wide-angle view of Baby Beach to the left (west) and Baldwin Beach to the right (east), facing the Pacific Ocean. This is standing at the sandy point, though it doesn't really look like it. Early morning at Baby Beach during low tide... great for a morning swim! Baldwin Beach, photo taken from the east end. Baby Beach is barely visible. Contact us for a free consultation on great private cottage, bungalow, home, estate and villa rental options.